Media Spinners: How did O'Connor survive - and McLellan got the sack? How did O'Connor survive - and McLellan got the sack? Brendan O'Connor a bad Irish joke! Someone tell me how Labor is back on track [Newspoll] with health and education... The Australian front page major banner today. Surely it is impossible to understand, even basis the nether - world standards of the Gillard kindergarten Ministers how Australia rates three  years behind our competitors in Asia. Surely impossible? But no - it is documented in the Gonski Report. Someone similarly tell me how Minister Assisting for School Education Brendan O'Connor survived as Minister? His meaningless disingenuous waffle on ABC TV Lateline on 20/2 rests uneasily with the reality. On the same programme the problem was set out on 17/2. If education is allegedly the terra - firma of these professional twirps - why are they failures to a degree impossible to understand? I got it: It was the fault of RG Menzies and John Howard. I guess the electorate may soon realize there are no arenas where Labor can avoid breaking all the wrong records. A Newspoll survey on major issues, conducted exclusively for The Australian, shows that while the government has narrowed the Coalition's lead on economic ..
17/02/2012 A new report says Australian high school students are now up to three years behind in maths compared with students in parts of Asia, despite increasing funding. 20/02/2012 Minister Assisting for School Education Brendan O'Connor joins Lateline to discuss the Government's response to the Gonski review of school funding. 28/02/2012 Finland's director of education Pasi Sahlberg joins Lateline to discuss the nation's world-leading education system. JULIA'S Gillard's government has regained its dominance over the Coalition in Labor's traditional strengths of health and education, but continues to trail on economic management and is failing to dent Tony Abbott over his refusal to sign up to the Malaysia asylum-seeker solution. A Newspoll survey on major issues, conducted exclusively for The Australian, shows that while the government has narrowed the Coalition's lead on economic management, it still trails by 12 points, down from the Coalition's 19-point lead in October. But Labor is seen by voters as better able to manage unemployment - leading 42 per cent to 38 per cent - as the issue re-emerges as a concern in the minds of voters amid talk of widespread job losses and more economic turmoil in Europe. 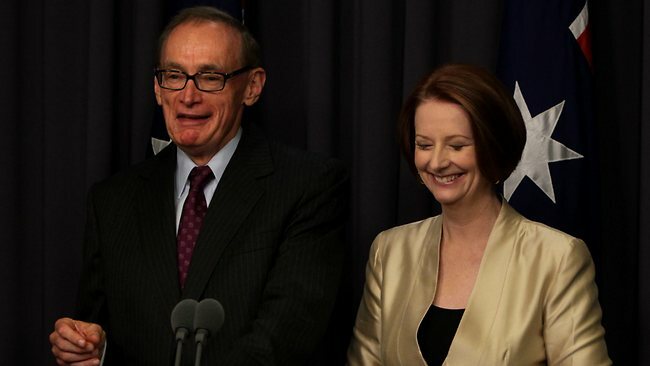 The poll, taken between February 23 and 26, came at the height of the leadership battle between Julia Gillard and Kevin Rudd, won decisively by the Prime Minister. Senior government ministers yesterday attempted to move on from the Labor leadership battle, controversy over the selection of former NSW premier Bob Carr to be foreign minister, and Ms Gillard's decision to leave one of her most loyal supporters, Joel Fitzgibbon, out of the ministry despite widespread expectation he would be recalled. But the Opposition Leader used his address to the Liberal National Party's Queensland campaign launch in Brisbane yesterday to attack the government's legitimacy. "I think Stephen Smith and Bill Shorten and Bob Carr might think they're the next prime minister of Australia, but I think I'll be the next elected prime minister of Australia," Mr Abbott said. Savaging the carbon tax, Mr Abbott said it was an anti-Queensland tax because it would hit the coal industry, which provided $3 billion in state royalties. "My message to the Labor Party today - you do not save the environment by killing the economy," the Opposition Leader said. Trade Minister Craig Emerson yesterday defended the appointment of Mr Carr to the Senate and the foreign ministry, saying Ms Gillard had exercised her authority as leader to pick the best ministerial team. "What we now need to do, as I've indicated, is to refocus on the right policies for this country," Dr Emerson told the ABC's Insiders program yesterday. said that not all expectations, however valid, could be met in a reshuffle. "It has been, and I'm not going to gild the lily on this, it's been a bruising encounter, the whole leadership contest, but the good thing about bruises is that they heal, and they are healing," Dr Emerson said. The resurgence in the government's stocks in health and education comes after the government successfully pushed means-testing the private health insurance rebate through parliament and after the release of the sweeping Gonski review into school funding. Labor has opened a nine-point lead over the Coalition on who voters think is best to handle health and Medicare, after being level on the issue at the last poll in October 7-9 last year. Labor's rating rose seven points to 44 per cent in the period, while the Coalition's rating fell from 37 per cent to 35 per cent. On education, Labor strengthened its position, improving its narrow 38-35 lead in October to a 46-33 lead in the latest poll. But only 34 per cent of voters believe Labor is best equipped to handle the economy, compared with 46 per cent for the Coalition. However, the result represented a six-point improvement for the government compared with the October poll. The poll was taken before Wayne Swan launched a blistering attack on billionaires and the rise in the power of vested interests, a theme he will expand on in an address to the National Press Club in Canberra today. The Coalition continues to dominate Labor on who is best-placed to handle asylum-seekers arriving in Australia. In the latest poll, Labor had improved its position to 21 per cent from 17 per cent in October, while the Coalition improved its position from 44 per cent to 47 per cent. In August, the High Court ruled that the government's proposed Malaysia Solution was invalid. Since then, the Coalition has refused to agree to bipartisan legislation to allow the Malaysia deal to go ahead, and nearly 1200 asylum-seekers arrived on unauthorised boats this year. The polls shows climate change has plunged in importance in the minds of voters, with only 35 per cent of voters ranking it as an important issue in February, down from 55 per cent in October after an unseasonably cool summer. And the asylum-seeker issue ranks below health and Medicare, education, the economy and leadership in terms of importance among voters. However, 60 per cent of voters rate unemployment as a very important issue, putting it ahead of national security concerns. Newspoll has not surveyed attitudes towards unemployment concerns since July 2008, when only 46 per cent rated it as a very important issue. On climate change, the government has reversed its 28-31 deficit in October to a 35-26 lead in the latest survey. On industrial relations, Labor increased its lead to 47-34 from 39-35 in October. It's amazing how Labor is alaways seen to be the better manager in health and education. But the socalist view in these areas, is nothing more than throw money around and create more public servants rather than spend the dollar on long term reform that gives direct benifit to all in these areas and solve the issues once and for all. LOL! We'll see if this poll will be confirmed. I think it is a rogue poll...it had the ALP increasing its primary vote and I just don't think so....it's interesting to highlight that other polls have not confirmed this one...so it's wait and see but I think this time....Newspoll got it wrong. I think the only economic policy I have heard from the Liberal party is to cut government spending. Says it all. Have a look at the AOFM website to see the amount of money this government is raising through loans knowing full well that the public are going to be stuck with their debt for years to come. We are speaking millions of dollars per day!